The world of corporate-run prisons has long been shrouded in secrecy. Prison reform has become a major topic of national conversation, yet details about what happens inside private prisons—which house 9 percent of the nation’s inmates—have remained largely hidden from public scrutiny. Access to prisons for journalists has become increasingly difficult over the years, and private prisons are not subject to some of the already tenuous disclosure requirements that apply to state- and federal-run facilities. That’s why Shane Bauer concluded that the only way to truly understand what was happening on the inside was to go there himself. Bauer witnessed stabbings, an escape, lockdowns—and his own transformation into a prison guard, with reactions and feelings he barely recognized as his own. “My Four Months as a Private Prison Guard” is a raw, gripping chronicle of both a company’s struggle to maintain control of a facility stretched to the limit by cost-cutting and mismanagement, and Bauer’s own fight to maintain his humanity in a system that is equally destructive of both inmates and guards. From the muckraker era to the 1970s, immersive reporting—by journalists such as Nellie Bly, Ted Conover, and Ben Bagdikian—shined light in some of our country’s darkest corners by going deep inside secretive institutions. But, as Mother Jones Editor-in-Chief Clara Jeffery notes in an essay accompanying this project, such undercover investigations have grown increasingly rare—in part because of fear of legal repercussions. Mother Jones returned to this immersive approach because, in our assessment, it was the only way to shed light on a subject of vital public interest. We followed ethical recommendations outlined by the Poynter Institute, including using the reporter’s real name and work history. Bauer also scrupulously documented what he saw inside, keeping detailed notes while on the job, writing extensive logs of his daily activities and interactions, and bringing in an audio recorder and a watch with a camera. Mother Jones took these extraordinary steps because press access to prisons and jails has been vastly curtailed in recent decades. There was no way to know what was truly happening inside but to go there, and by doing so, Bauer was able to expose a world that had long been shrouded in secrecy. In addition, the immersion approach allowed Bauer to understand what both guards and inmates go through, and to present an empathetic and fully rounded portrait of their world. 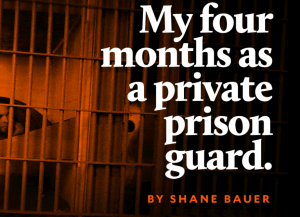 Published in June 2016, Shane Bauer’s “My Four Months as a Private Prison Guard”— accompanied by gripping undercover footage, data, primary documents, and a radio documentary—sparked a dramatic media response and earned praise from readers, journalists, celebrities, prison reform organizations, and even former Corrections Corporation of America (CCA) employees and inmates. A federal investigator reached out to Bauer, noting that the investigation had resonated with his auditing team. Within a few weeks, the Department of Justice announced it would end its use of private prisons and the Department of Homeland Security said it would consider doing the same. The conversation and heightened awareness of what happens inside private prisons created a ripple effect that was apparent in not only the DOJ’s decision, but also the plummeting of CCA stocks, class-action lawsuits filed by company shareholders, and CCA’s corporate rebranding as CoreCivic. “My Four Months as a Private Prison Guard” continues to receive accolades and has ranked among numerous lists for the best reporting of 2016. Nearly 2 million people have now read the 350,000-word exposé, and others continue to dive in and discuss it. And with President Donald Trump signaling that he wants to ramp up the use of private prisons, Bauer’s investigation will prove to be more relevant than ever.